Old Memories & a Recipe Updated!! Hello Friends!! 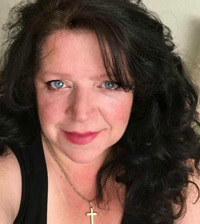 I know you probably think I've abandoned my Blog, and I am sorry about that, but nothing could be further from the truth. I have, however, taken some time off to take care of myself, and nurture my relationships, and spend time with my Friends and Family. I am still doing that! But have found the time to share some of that with you!! It is December!! I know you already know this, yet, I want to tell you that, for me, this is "The Most Wonderful Time of the Year"! Even as January creeps closer. I love this holiday time, celebrating the Birth of Jesus, and having "special time" to spend with my Loved ones. 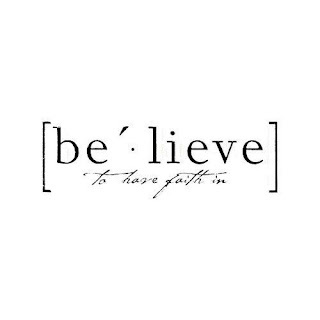 I truly believe, and wish people would have a little Christmas in their hearts all year long, present company Included!! With that said, if you've been keeping up with me on Shoestring's Facebook Page, you'll know that I have been doing alot of baking, decorating and spending time with Friends and Family! I can think of no better way to spend my time!! This year, I called all my Sisters, Nieces, Grand Nieces, In-laws.... basically, every female member of my family to start things off with a "Begin Ladies Baking Day!" the Saturday after Thanksgiving!! (it was a Smashing success, by the way!) I want to share some of the things we made with you! Some of the decorations and arrangements I've been working on with you over the next month. I simply can not, prepare, decorate and post Holidays and occasions a month ahead of when they actually are! There! I've said it! Most Bloggers do this to help provide Inspiration! They all do a wonderful job at doing just that! For me, however, it is not practical (and I feel like I miss out on the here and now). I am my Blog's photographer, writer, creator, and editor. It takes a bit of work and time to share these things with you and I love doing it! But, I often find myself doing or making something fun and thinking I should have took a picture of that "before" so I could show you how to get the same end result. What can I say, "I am doing my level best! Sorry, back to the Baking Day!! Every year My mother, I and a sister here and there make a Bounty of Christmas Cookies, Breads and Candy! This year I wanted to start our "Baking Day" as a means of having and cherishing time with my Family, but also to alleviate the pressure of all these goodies from my Mum's list of to do's! We make ALOT! 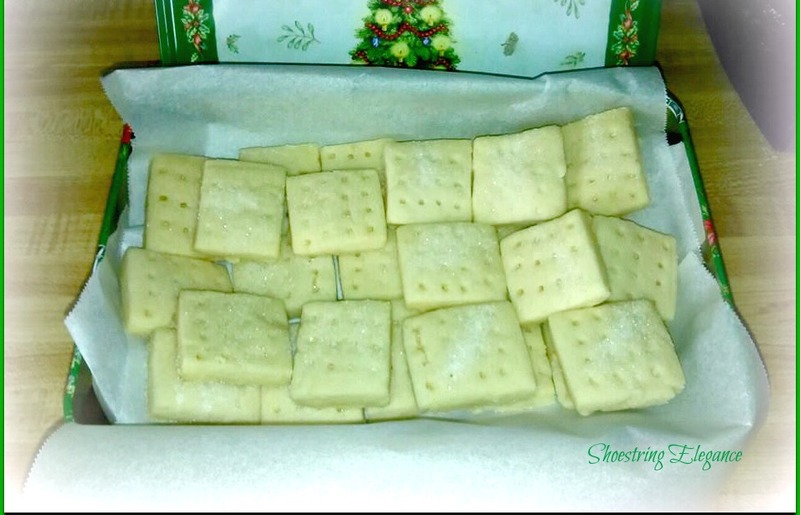 In the last couple of weeks, I made some yummy "Shortbread Cookies", that are, wonderfully, common place for most of my Canadian Family and represent special memories, for me, of my Grandmother. Shortbread Cookies are not really as enjoyed here as much as others, and I wanted to do something about that!! I made a beautiful batch of these Nova Scotia-style Shortbread Cookies, the day before my families baking day to be decorated and include in what we all have to share. This week, I made another batch. This time, with a little more dimension, to share @ A Christmas Tea with my Women's Group from Church. So here's the simple trick I did to make them more appealing to most! 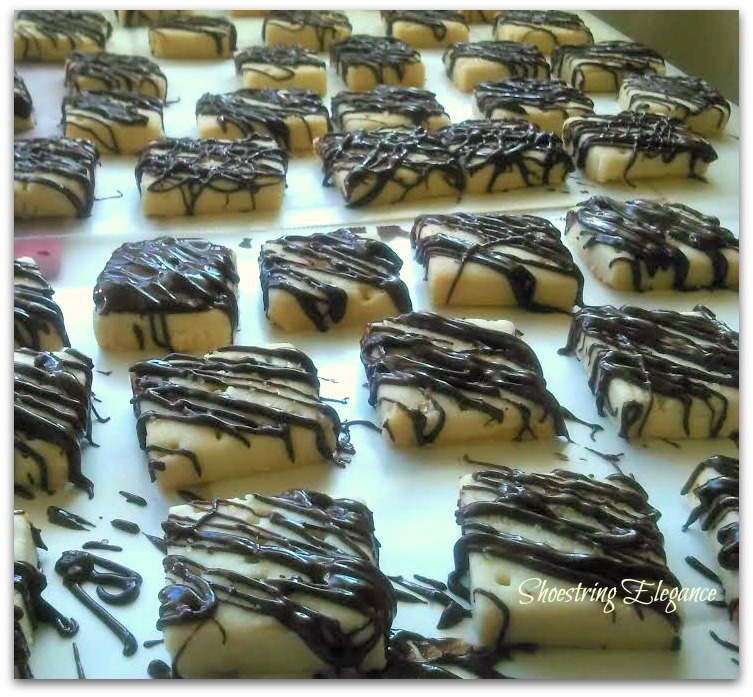 They usually are a very basic 3 to 4 ingredient, no frills, delicious buttery cookie. That, in my opinion cannot be beat to have with tea! 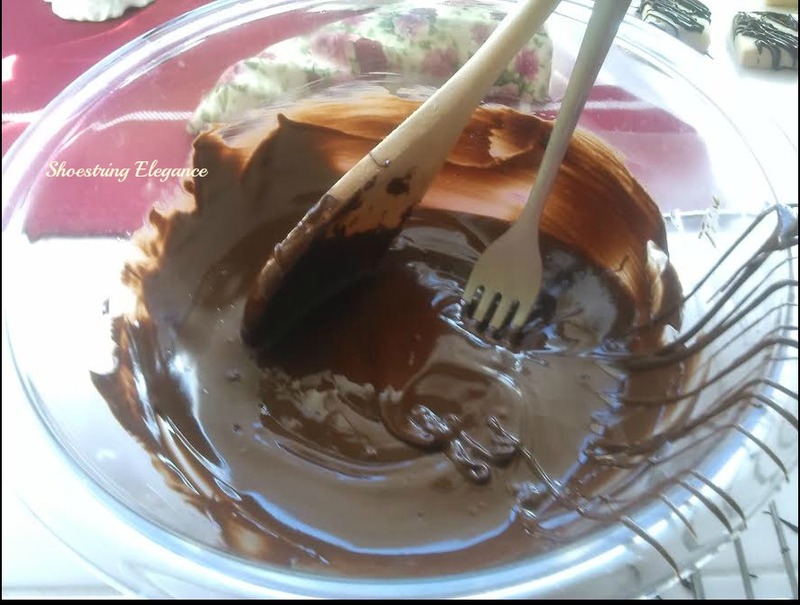 But, to make them universally appealing and festive, I simply melted some chocolate in a double boiler, about 1/2 cup of semisweet chocolate and about a teaspoon of flavorless oil (like canola) The oil helps maintain the nice color and shine! 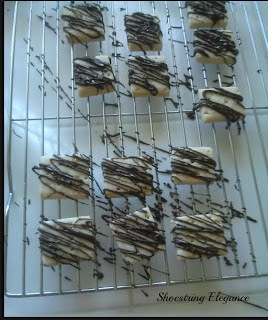 Then, you just take a fork, and on a wire rack OVER wax paper, have fun drizzling the chocolate back and forth over your shortbread, it couldn't be easier!! But what a difference! They were a big hit at my Christmas Tea and with friends and family. 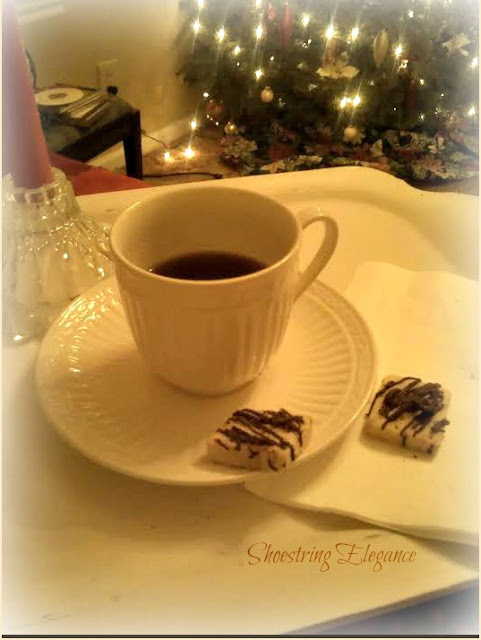 I'm thankful to tell you that there were a few remaining, that I can now enjoy with tea and quiet, going over the fresh memories of this Christmas just passed. 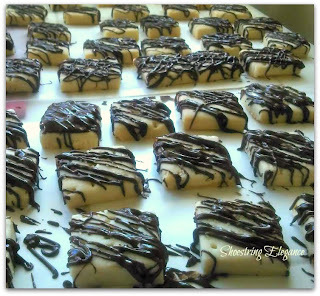 Such an easy way to "fancify" a wonderful old recipe!! I hope you all had a wonderful Christmas and are enjoying a little quiet time before the New Year begins! 2014!! Very difficult for me to fathom "2014!. As always, I wish Many Blessing for you and yours!! Merry Christmas to you all! Wishing you all many Blessings today and every day. 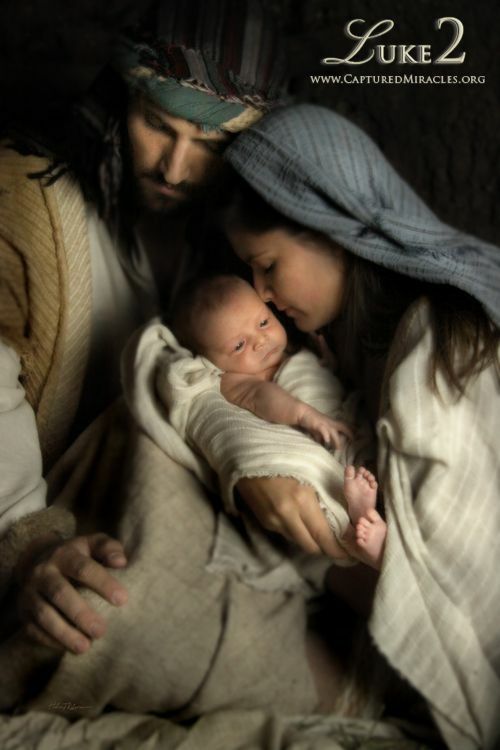 I pray you are all having a wonderful day surrounded by your Loved ones.